Are you getting a bit tired with all the machine learning ballyhoo? 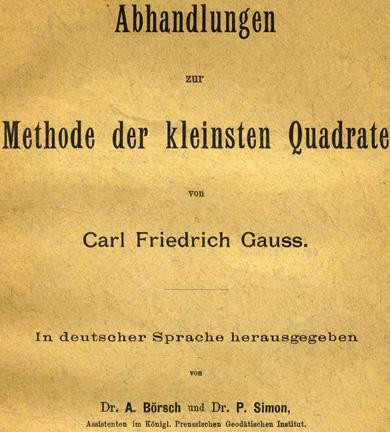 You can blame it all on a German mathematician(*), Carl Friedrich Gauss, who started the futuristic “mega-trend” back in 1809: He showed us how to “train” a straight line to pass nicely through a cloud of unruly, scattered data points. To find, in effect, a path of least embarrassment. Two+ centuries later it is still a profitable enterprise to invent elaborate variations of that theme, now going under the more exalted name of “supervised learning“, which may or may not include “deep learning”. Instead of a linear function we use more complex (non-linear) siblings but conceptually the difference is only a minor technicality. What would Gauss think of the current hype cycle? Would he be the founder of the mysterious and world-conquering #AI startup gauss.ai? Or would he, as he did in his own time, lament “das Geschrei der Böotier” (the outcry of the Boeotians) and focus on delivering something of lasting value? Previous post If programming languages were human languages which one would be which?